The seventeenth edition of A Peace Officer's Guide to Texas Law is provided to Texas Police Association members as a benefit of membership. The Police Legal Digest contained in each issue of the Texas Police Journal, and the Guide are intended to serve as vital sources of up-to-date information for Texas Peace Officers. The link below will take you to the new 2017 Guide in online format. 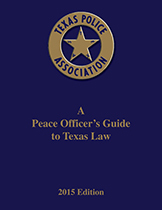 The sixteenth edition of A Peace Officer's Guide to Texas Law is provided to Texas Police Association members as a benefit of membership. The Police Legal Digest contained in each issue of the Texas Police Journal, and the Guide are intended to serve as vital sources of up-to-date information for Texas Peace Officers. The link below will take you to the new 2015 Guide in online format. The fifteenth edition of A Peace Officer's Guide to Texas Law is provided to Texas Police Association members as a benefit of membership. The Police Legal Digest contained in each issue of the Texas Police Journal, and the Guide are intended to serve as vital sources of up-to-date information for Texas Peace Officers. The link below will take you to the new 2013 Guide in PDF format. This year the new 2013 Guide is also available in an online format. The fourteenth edition of A Peace Officer's Guide to Texas Law is provided to Texas Police Association members as a benefit of membership. The Police Legal Digest contained in each issue of the Texas Police Journal, and the Guide are intended to serve as vital sources of up-to-date information for Texas Peace Officers. The link below will take you to the new 2011 Guide in PDF format. The thirteenth edition of A Peace Officer's Guide to Texas Law was provided to Texas Police Association members as a benefit of membership. For 2009, the Guide also contained an attached Legislative Update. The links below will take you to the Guide and Legislative Update components.